Best Short winner is "Devi"
LOS ANGELES, CA (April 10, 2017) – The 15th annual Indian Film Festival of Los Angeles (IFFLA) concluded on Sunday evening (April 9) with a red carpet and gala that featured the Los Angeles premiere of Shubhashish Bhutiani’s "Hotel Salvation" starring Adil Hussain who was in attendance, as well as the presentation of the festival’s Grand Jury and Audience Choice Awards presented by HBO. The festival is widely recognized as the premiere showcase of groundbreaking Indian cinema globally. The 15th annual Indian Film Festival of Los Angeles (IFFLA) took place April 5-9, 2017 at Regal L.A. LIVE: A Barco Innovation Center in Los Angeles, California. This year the festival featured two World premieres, five North American premieres, five U.S. premieres, and eleven LA premieres. This festival premiered work representing twelve languages, and highlighted a combination of exciting first and second-time filmmakers and experienced cinema masters returning with new work. "The Golden Wing", directed by Bobby Sarma Baruah took home the Grand Jury Prize for Best Feature. In awarding the Grand Prize, the narrative jury stated: “We wanted to recognize this work for its artistry in storytelling and filmmaking, its exploration of class and society, and for the seamless and elegant way in which it incorporates music and performance. This is a film that celebrates a woman’s independence, her compassion and humanism and ultimately her enduring reputation as an artist.” "The Golden Wing" was filmed in Assam in the rare Rajbangshi language. The audiences at this year’s IFFLA chose "A Billion Colour Story" as their favorite narrative feature film of the festival, and "An Insignificant Man" as their favorite documentary feature. "Aaba" was chosen as Best Short. Best Feature (Documentary): "An Insifnificant Man, directed by Khushboo Ranka and Vinay Shukla. 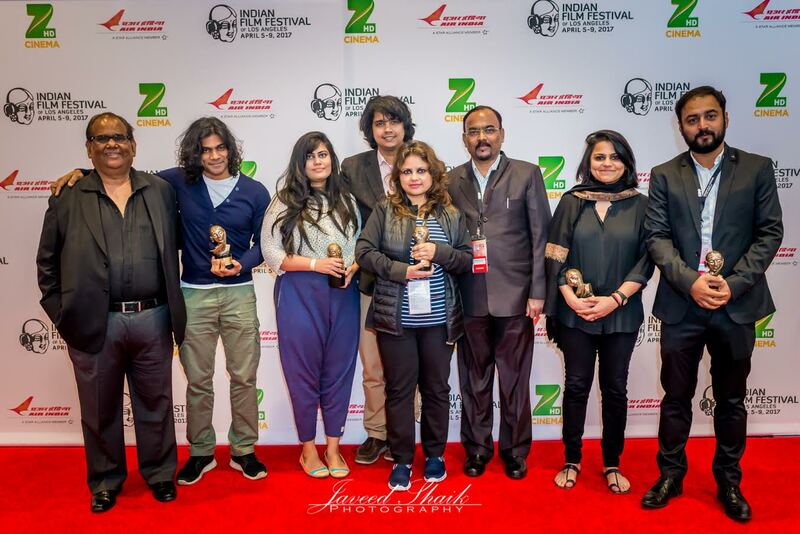 From left to right: Producer of "Billion Coloour Story" Satish Kaushik and director Padmakumar Narasimhamurthy; Directors of "An Insignificant Man" Khushboo Ranka and Vinay Shukla; director of "The Golden Wing" Bobby Sarma Baruah and producer Basanta Kumar Baruah; director of "Devi" (Goddesses) Karishma Dube; director of "Aaba"(Grandfather) Amar Kaushik. The five-day festival is the premiere platform for the latest in cutting-edge global Indian cinema and bridges the gap between the two largest entertainment industries in the world – Hollywood and India. The festival will showcase nearly 30 films from the Indian filmmaking community across the globe, host the highly anticipated Opening and Closing red carpet Galas, and the Closing Awards ceremony.